From right to left: Marina Gay, Marta Vilaseca, Mar Vilanova, Laura Villareal, Mireia Díaz-Lobo. IRB Barcelona steps into High-Throughput Proteomics. After passing an external evaluation, the Mass Spectrometry Core Facility has been renamed “Mass Spectrometry and Proteomics Core Facility”. Its mission is “to apply advanced proteomic methods to help researchers study diseases, pathways, targets and drugs effects,” says Core Facility manager Marta Vilaseca, who emphasises the contribution of her team to cutting-edge research at the Institute. The facility has recently been enlarged and now occupies an additional area in the PCB to host a new Orbitrap Fusion Lumos, which has just been installed and is fully operational. Marta is looking forward to making the best use of this powerful analytical tool. 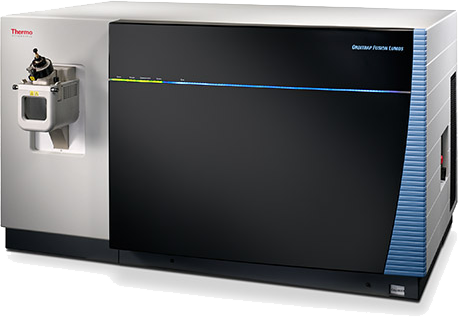 “Thanks to this new mass spectrometer, we will be able to identify thousands of proteins, gain further insights into their post-translational modifications, mutations and splice variants, and quantify them in a high-throughput manner. Using quantitative proteomics strategies, we will be able to have full proteome data sets in a reasonable timeframe— a few hours per cell line. Orbitrap allows the simultaneous comparison of up to 10 cellular states, including biological replicates, and this feature results in a significant saving of time,” explains Marta. Marta believes that these characteristics will allow IRB Barcelona scientists not only to be competent in the well-established classical bottom-up proteomics, but also to pioneer the top-down—or intact-protein—approach. Bottom-up high-throughput proteomics techniques involve protein digestion with enzymes—a process that breaks them up into peptides. On the basis of the molecular weight of the peptides and the fragments thereof, scientists can deduce information about the identity of the proteins present in a given sample and about their modifications. Marta emphasises that “by measuring and quantifying whole proteins, we achieve more reliable identification and better characterization of individual proteoforms”—a term that denotes the different molecular forms in which the protein product of a single gene can be found. “The advantage of the top-down philosophy is that it can make these distinctions,” says Marta. “The two approaches are complementary. The bottom-up approach is more developed both technically and in terms of data analysis, whilst the top-down concept is still under development. But its potential is enormous. Combining both approaches can give a deeper understanding of the biological processes that determine human health and the development of disease,” she adds.